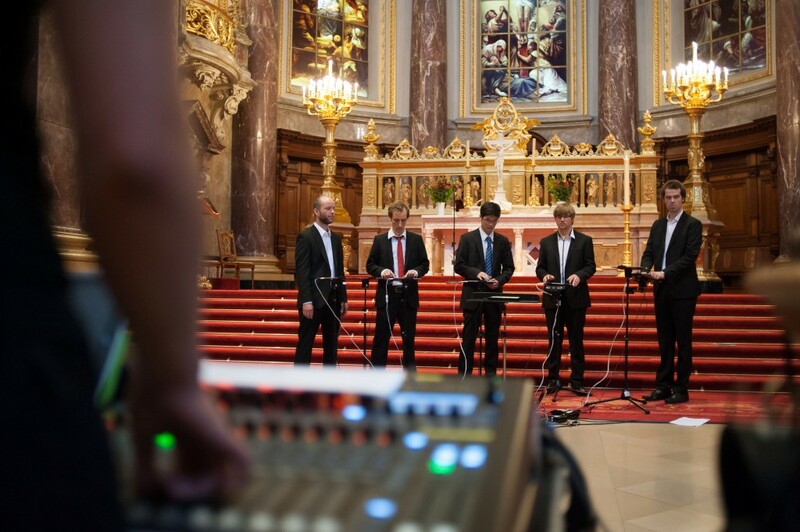 The DigiEnsemble’s performance of Bach’s Christmas Oratorio played on mobile devices only at the Berlin Cathedral in 2012 was a huge success. In celebration of the Berliner Dom’s 20 year anniversary, the cathedral’s organist Andreas Sieling and the DigiEnsemble paired up and gave their first concert together on June 6, 2013. For the anniversary show, the musicians composed four pieces. Their intention was to experiment with the sound possibilities of the cathedral’s interior architecture. They used 12 loudspeakers, placed all around the cathedral, and created new sounds as “frozen echoes” and “fluid music” (rainshower in the dom). Here, we’d like to thank Audiofly Soundtec GmbH for the technical support.